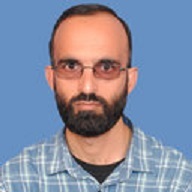 Anwar Ullah currently works at the Department of Biosciences, COMSATS Institute of Information Technology. Anwar does research in Biophysics, Biotechnology and Biochemistry. Their current project is 'Protein purification and characterization from both natural and recombinant sources . He is working with proteins from snake and spider venom, plant, bacterial, fungal and viral proteins. Ph. D. CNPq-TWAS- Brazil, Italy (2009-2013). ICTP, fellowship South Africa (2013). Tyrosine binding and promiscuity in the arginine repressor from the pathogenic bacterium Corynebacterium pseudotuberculosis Mariutti RB, Ullah A, Araujo GC, Murakami MT, Arni RK. Biochem Biophys Res Commun. 2016 Jul 8; 475 (4):350-5. doi: 10.1016/j.bbrc.2016.05.091. PMID: 27233609 Impact Factor: 41.